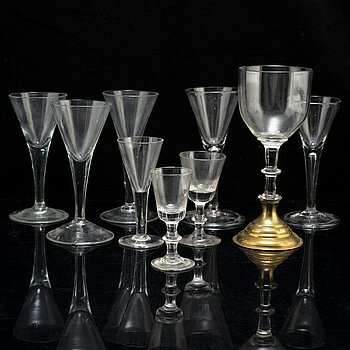 A set of nine various glasses, ca 1800 and later. A 19th Century painted gate leg table. 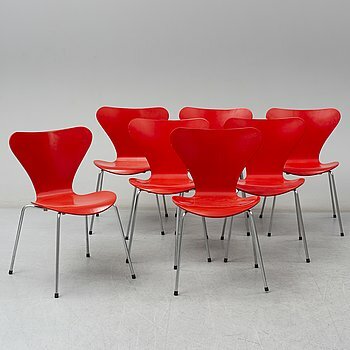 ARNE JACOBSEN, a set of 7 'Seven' chairs, Fritz Hansen 1988. 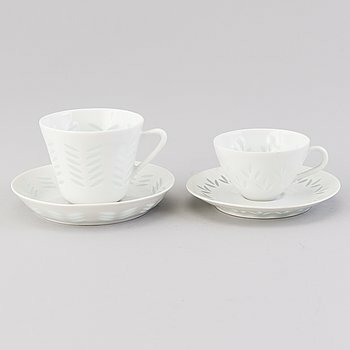 FRIEDL HOLZER-KJELLBERG, A 23-piece porcelain set for coffee and espresso, signed F.H.Kj. Arabia Finland. GUNNAR CYRÉN, glas, 4+4 st "Nobel", Orrefors. 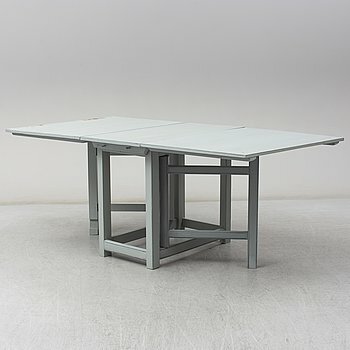 A Gustavian style painted dining table, second half of the 20th century. 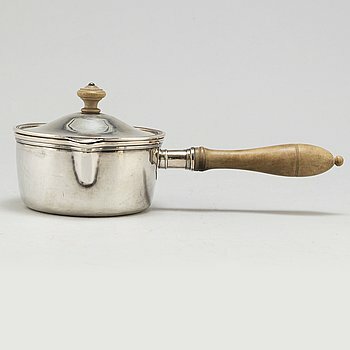 TAPIO WIRKKALA, a 24 piece glassware set of 'Tapio', Iittala. 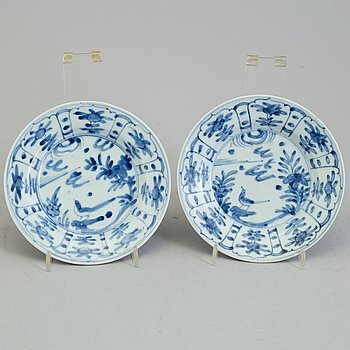 TWO CHINESE PORCELAIN PLATES, late 18th century. NANNY STILL, a glass bottle from Riihimäen Lasi Oy, Finland. 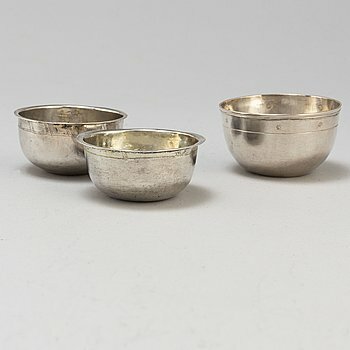 HANS-AGNE JAKOBSSON, 15 small brass candlesticks, Markaryd. Seventeen 'Nobel' fish forks by Gunnar Cyrén for Gense. GUNNAR CYRÉN, 18 pieces of cutlery 'Nobel' by Gense. ERIKA LAGERBIELKE, 24 pcs of 'Divine' wine, champagne and water/beer glasses. A SET OF 4 SIMILAR GEMLA CHAIRS. GUNNAR CYRÉN, a 50 piece set of 'Nobel' stainless steel cutlery. A pair of second half of the 20th century sterling silver candle sticks, Israel. 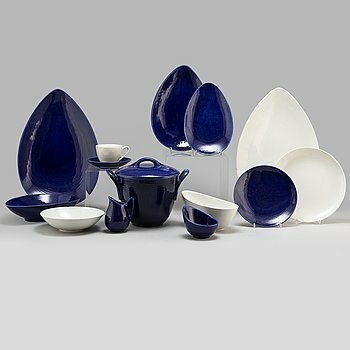 SIGVARD BERNADOTTE, A 91-pcs 'Christineholm' /'Marianne Royal Blue' dinnerware and coffee set. 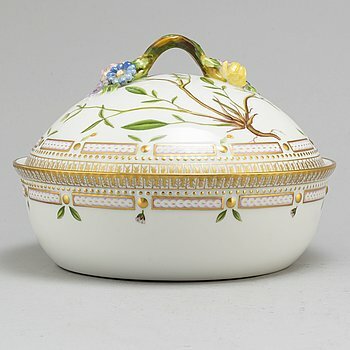 STOLAR, 2 st snarlika, svensk rokoko, 1700-talets andra hälft. A set of five Gustavian style chairs, second half of the 20th century. A dining table width twelve chairs, first half of the 20th century.